We’d love your help. Let us know what’s wrong with this preview of Greetings From Belleville, New Jersey, collected writings by Anthony Buccino. Belleville native Anthony Buccino has collected his favorite and most-requested writings about life and growing up in Belleville, New Jersey. 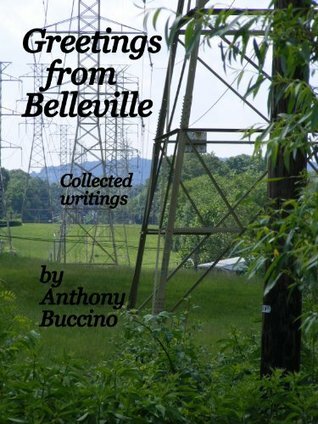 Greetings From Belleville, N.J., is Buccino's fourth collection of essays but the first wholly dedicated to his collected writings about Belleville. More than forty essays and reflections on everything from junior high school bullies Belleville native Anthony Buccino has collected his favorite and most-requested writings about life and growing up in Belleville, New Jersey. Greetings From Belleville, N.J., is Buccino's fourth collection of essays but the first wholly dedicated to his collected writings about Belleville. More than forty essays and reflections on everything from junior high school bullies to selling pretzels for Ed Strat at Belleville High School football games at Municipal Stadium. This collection includes the Excellence in Journalilsm award-winning Don the TV man. To ask other readers questions about Greetings From Belleville, New Jersey, collected writings, please sign up.